Fast growing FRiENDi GROUP raises new equity and debt to fund further regional expansion. Dubai, UAE 26th April, 2011: FRiENDi GROUP the leading MVNO/B-brand provider in the MENA region has secured USD 25 million of new funding to further accelerate expansion plans across the Middle East, Africa and Asia region. FRiENDi GROUP is an award-winning telecommunications group established in 2006 that is headquartered in Dubai Internet City, and operating as a Mobile Virtual Network Operator (MVNO) and B-Brand enabler. FRiENDi GROUP is using a proven business model delivering significant benefits to its customers and mobile telecom operator partners, and today is operating either MVNOs or B-brand partnerships in Oman, Jordan and Saudi Arabia. Commenting on the new funding Mikkel Vinter CEO& Founder, FRiENDi GROUP said; “FRiENDi GROUP continues to expand rapidly, and benefit from telecom markets across the Middle East, Africa, and Asia region moving towards increasingly segmented customer propositions. The new funding from distinguished financial institutions and investors supports FRiENDi GROUP’s vision of establishing a multi-market regional footprint. We are particularly delighted that the approval of the Standard Bank facility follows an exhaustive bankability review by Standard Bank of FRIENDI GROUP’S operations and its future prospects”. The USD 10 million equity element of this funding is provided partly by existing FRiENDi GROUP shareholders, led by Dolphin International LLC of Oman, and partly by a new shareholder, National Technology Enterprises Company (NTEC) of Kuwait. NTEC is mandated by the Kuwait Council of Ministers with a clear strategy and goals, and was created to play a vital role in servicing major stakeholders in Kuwait with their technology needs. NTEC's business model is that of a Technology Projects Development company utilizing investment tools such as Private Equity, Venture Capital and Direct Investments to initiate and stimulate Technology Projects in Kuwait and the local region. Amro Baltaji, Group Vice President of Communications. 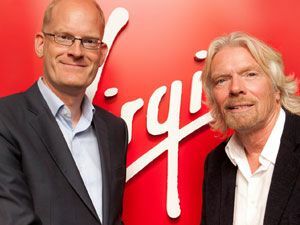 Nick Fox – Virgin Management – Director of Communications. لا تأخذ فقط برأينا عن أنفسنا حول خدماتنا- فهناك العديد من الأشخاص الذين عبروا عن سعادتهم و رضاهم بخدماتنا..